I attended the Brunswick Town Hall, for a special hearing by Moreland Council considering oral presentations to submissions on the Moreland Integrated Transport Strategy and the Moreland Parking Policy. I was number 19 on the list of presenters as I had made a submission on behalf of Climate Action Moreland (Read it here). Many of the presenters spoke on the personal circumstances of traffic, parking, cycling and walking in Moreland, and concerns how the strategy and policy might affect employment or business. There were some highly emotional moments recounted. These were all important particular insights. They are important and need to be considered by our local policy makers, our Councillors. But we can sometimes get consumed by day to day issues around urban consolidation, traffic and parking changes and ignore the essential drivers for change. My oral presentation was a much broader brush: the enormous amount of transformational change required if we are to meet the scientific targets agreed in Paris in 2015 at the UNFCCC conference COP21 to safeguard the future of our children, including on transport in our municipality. C2. Pathways limiting global warming to 1.5°C with no or limited overshoot would require rapid and far-reaching transitions in energy, land, urban and infrastructure (including transport and buildings), and industrial systems (high confidence). These systems transitions are unprecedented in terms of scale, but not necessarily in terms of speed, and imply deep emissions reductions in all sectors, a wide portfolio of mitigation options and a significant upscaling of investments in those options (medium confidence). budget a massive increase in bicycle funding to enable it to meet its commitments in the Moreland Bicycle Strategy 2011-21 and set better targets for later years. bring all footpaths up to standard (if necessary, creating them) and maintained that way, so that everywhere in Moreland is easily walkable. assess and reduce roundabouts, which are dangerous for pedestrians and cyclists. 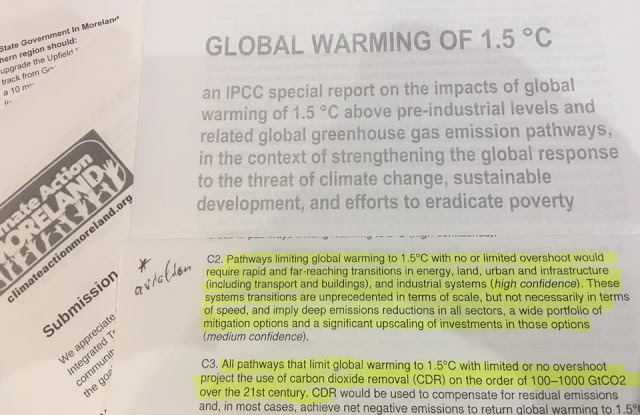 I suggested to Councillors they should peruse the Summary for Policy Makers IPCC 1.5C report (PDF). As policy makers at the local municipal level this document also applies to them in their decision making. There are hard decisions to make when we face the need for transformational change, and some citizens may be affected more than others. But if we don’t make these changes, we will all be worse off. So my local Councillors need to weigh up the strategic direction and particular circumstances. How to lead and engage our community to become zero emissions in transport using the limited control powers they have, to create a sustainable and liveable City without causing undue stress and disadvantage.